Chiba University, where I earned my bachelor degree, is located in front of the Pacific Ocean, I nostalgically remember the campus by the strong and humid wind that brought and spread the smell of fish. Friends of mine told that it was easy to distinguish me walking in the campus from the crowd of the students. I was always late and rushing to classes, wearing a bright green coat, fifteen piercings on my ears, and high heel sandals, with the gradation colored damaged hair, and I always held a mug and an enormous size of schedule book. At the end of the year, my schedule books usually become too thick to close, and both side of the covers are ripped off. Their weights exceed more than 3kg, which damaged my bag, hence I hold the schedule book directly with my hands. 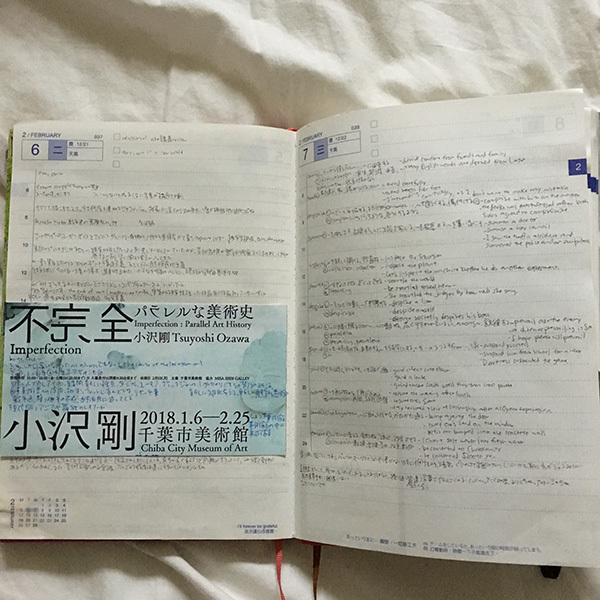 I recorded everything on my schedule book and brought it everywhere with me. The collection of my schedule books are my life itself. 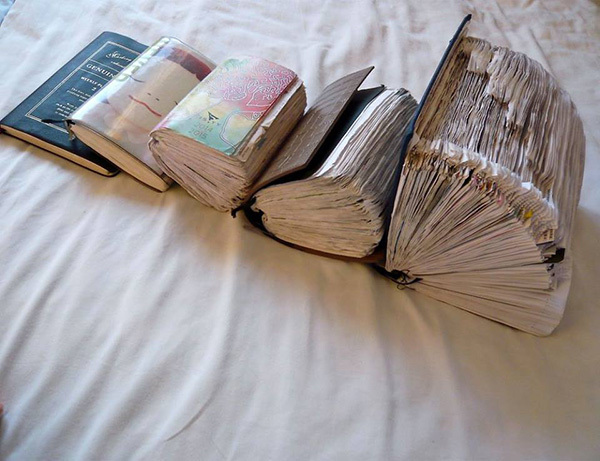 The schedule books from 2011 to 2015: they become thicker and thicker every year. 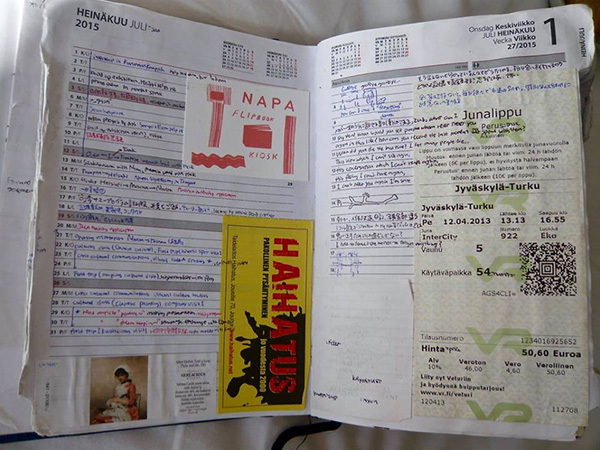 The schedule book of 2014: I lived in Joensuu, Finland at this time. I remember the natural day light was blue there. 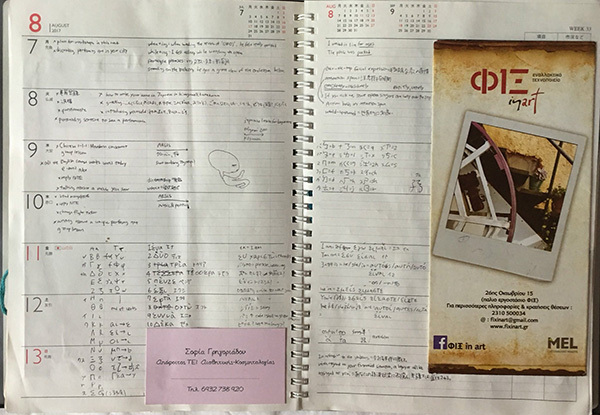 The schedule book of 2015: I bought the new schedule book in Joensuu, and I spent the summer in the village in the South Finland called Jousta. 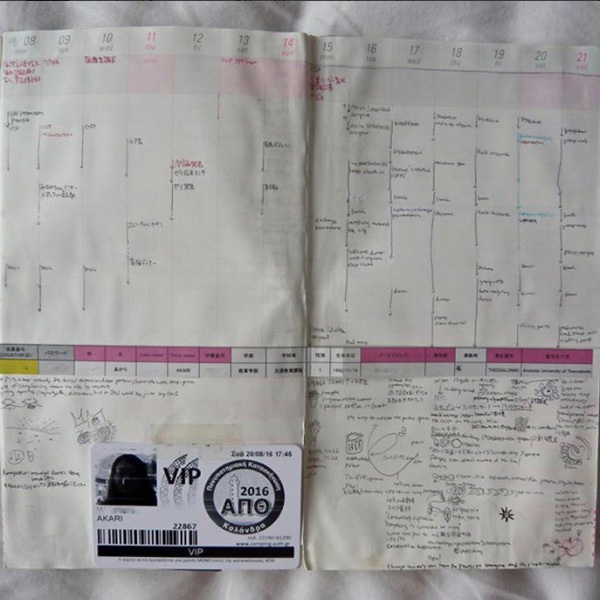 The schedule book of 2016: these pages were written when I visited Thessaloniki, Greece for the archeological project. 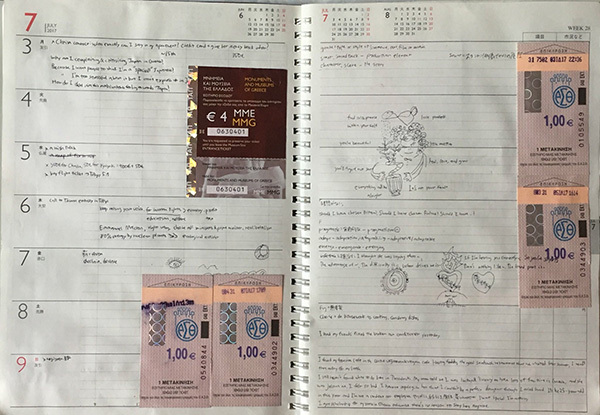 The schedule book of 2017: I spent the summer in Thessaloniki again, and moved to Taipei in the autumn. 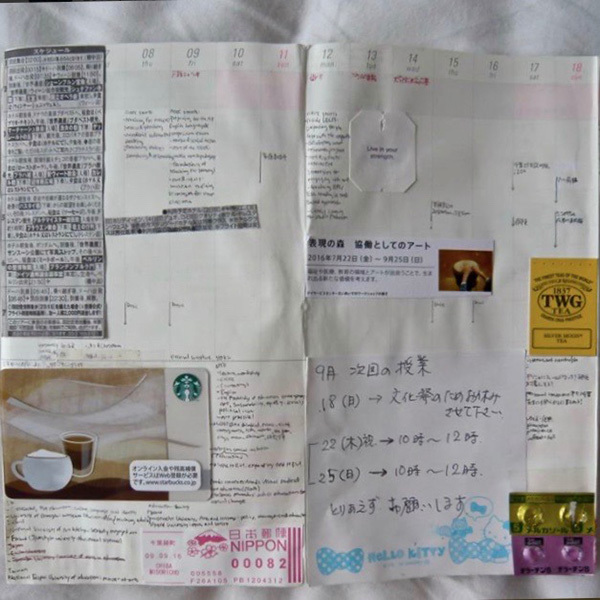 The schedule book of May 2018: I currently study in the master program in Taipei. The last pages are the exchange between my flatmate and me describing our last nightmares. I write down everything in my schedule books at one sitting. Everything new that moves me and interests me. 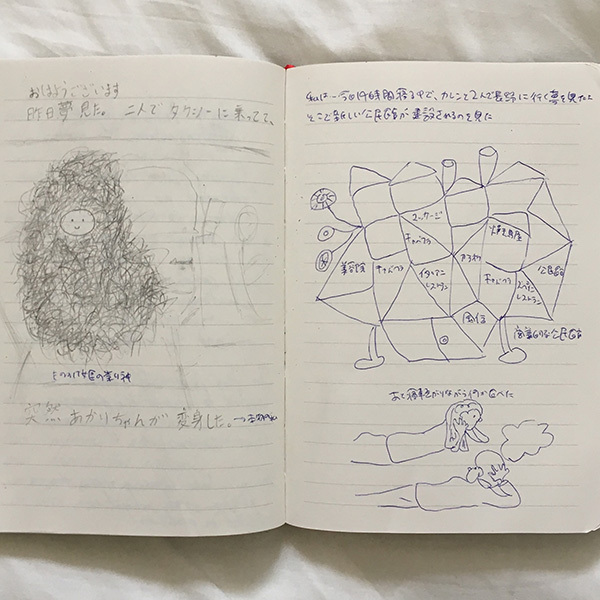 Sometimes I research about it or consider about it for a while, and start writing in both Japanese and English without revising or correcting. I write my plan, assignments, to do list, shopping list, events, accidents, feelings, criticism, goals, dreams, tasks, ideals, new words, drawings, memories in childhood, news, poems, books, films, ideas, exhibitions, friends of mine, what I lost, what I found, every brilliant thing, etc. 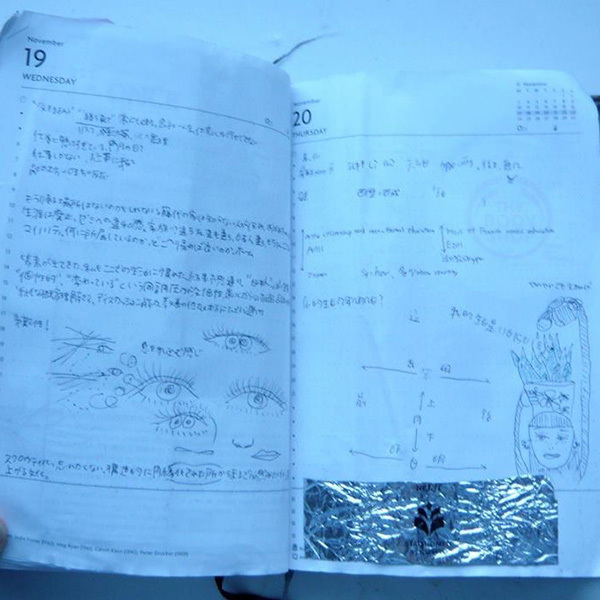 Not only do I write down, but also paste so many stuffs on my schedule books, they probably look like a collage. As long as it does not exceed the size of the schedule books, I basically paste anything in them; entrance tickets for museums, articles of newspapers, drawings, notes, flight tickets, name cards, photos, pictures, foreign coins, post cards, letters, bus tickets, stickers, labels and bags of tea, stamps, tags, pamphlets, packages of candies, film tickets, etc. Having bought new schedule books in the cities where I celebrated the new year, they came from Tokyo, Joensuu, and Taipei. I chose the practical and functional ones. 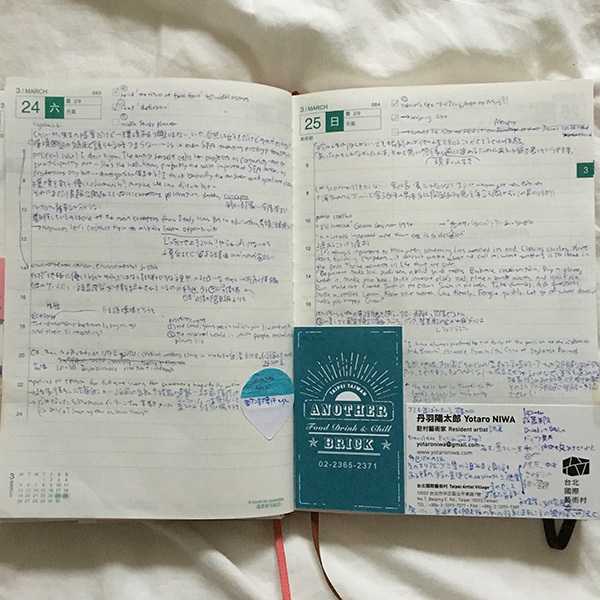 Ones that had one page for each day, the straps, and bookmarks. These tough books were selected since it had to be bearable for the weights. Additionally having the pages for the maps and station lists made the schedule books perfect. I want to be fully aware that I can choose my life. 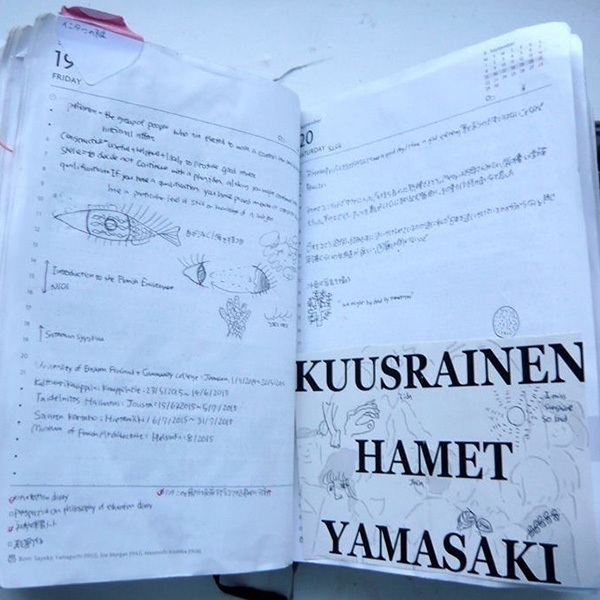 I record my life in the schedule books to forget. Writing is the only way to make me realize my raw desires and emotions. Writing makes me forget and leave things behind. My flatmate once told me that writing for him was the same as excretion. While having contradiction and frustration inside of me, I try not to be moved by rage but rather respect and response to my sensitivity and feelings. 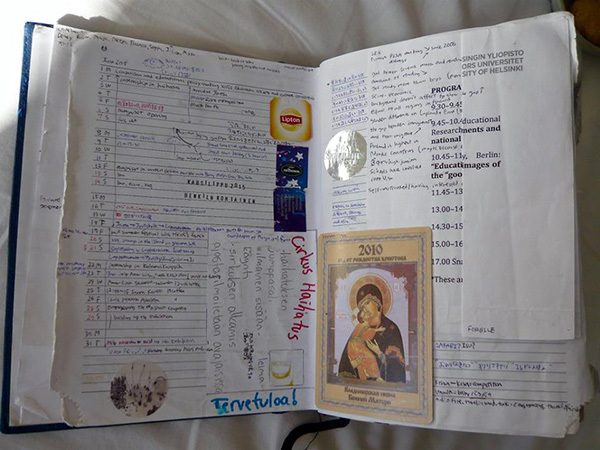 My schedule books help me to move forward and record the process of all the struggles.